We’d love your help. Let us know what’s wrong with this preview of Saving Lucas Biggs by Marisa de los Santos. To ask other readers questions about Saving Lucas Biggs, please sign up. Lauren I would think this could be fantasy. My son asked me to read this so we could talk about it, that makes my heart happy and so I did. 4.5 stars. Great beginning with Margaret receiving devastating news in 2014. Josh has a shocking start to a new stage in life in 1938. One person ties these 2 characters' lives together, can they save him? Love the alternating POV, authentic voices to their eras, and a sprinkle of time travel! Storytelling excellence! This review has been hidden because it contains spoilers. To view it, click here. Every time I read a Marisa de los Santos book, there's a sense of jubilation that bubbles up in me. Her narrative and choice of wording, make it so that I strongly believe in the cause the protagonist is fighting for. I immensely enjoyed the story of Margaret O'Malley, a thirteen year old, who thought that travelling back in time would no doubt save her daddy. It did not, well it might've indirectly, because Margaret came back, from the past, with a load of knowledge to better assess the present Every time I read a Marisa de los Santos book, there's a sense of jubilation that bubbles up in me. Her narrative and choice of wording, make it so that I strongly believe in the cause the protagonist is fighting for. I admit to being a sucker for time travel novels even though I end up actually liking very few of them. 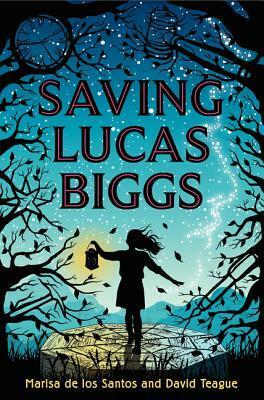 I liked Saving Lucas Biggs by Marisa de los Santos and David Teague. This is a review of the ARC received from the publisher in exchange for a fair review. This book sucked me in in the best of ways, I wasn't expecting that to be honest. But from the first sentence I was hooked, and I could not put this book down. This is how the story b Originally posted here at Random Musings of a Bibliophile. In the time it took a man to speak a single sentence, I discovered three things: there's a reason a judge's robes look like the Grim Reaper's, a blooming jacaranda tree can feel like a big slap in the face, and there is such thing as a silent scream. How all these things come together and the character giving them voice are riveting. Margaret's father has been convicted of murder and the judge has just handed down a death sentence. Imagine how that would affect a thirteen year old, particularly when her father is innocent. Margaret is falling apart, in turmoil, and will get help from any source she can. Grandpa Josh, the grandfather of her best friend Charlie, suggests a way, one that would mean breaking all the rules her family lives by. Margaret's family has an inherited ability to time travel, something Josh claims to know from being well acquainted with Margaret's great great aunt. He tells her to turn things around she can go back in time and make the life of the judge, Lucas Biggs, different. The story is told in first person, mostly from Margaret and the Josh of the past as he is an integral part of Luke's story having been his best friend. Charlie gets a few chapters too. All the voices sound different enough to be genuine. The characters are interesting too, but not thoroughly fleshed out and nuanced. This is a short book and it is incredibly plot heavy. But the story is a good one, and the characters shine as much as they need to in order to tell it. I enjoyed the history of the town of Victory, Arizona. Through Josh's perspective, the reader gets an up close view of what life in a mining town was/is like. There is a labor dispute and terrible things happen that affect the town for decades to come, right up to the work Margaret's father was doing and the events that led to his arrest. It is a fascinating story with many difficult issues and themes explored. I like how the authors included the harsh realities and truths of all these subjects. It is first and foremost a story of redemption, and how no one is ever too far gone in one direction to turn their life around and go a different way. The time travel element is an intriguing one. At first I was highly skeptical, but it began to make sense in a way that fit perfectly in the book. I am fairly particular about the way time travel works and how it affects lives, and this book handles it exactly the way I like. As every character referring to it says, history resists. If you are familiar with the Oxford Time Travelers books by Connie Willis, what a time traveler can do works in same way here as it does in those books. It is never explained in more detail than those two words, history resists, but it doesn't need to be. It is shown perfectly. I enjoyed this thoroughly and think it is fast paced and engrossing enough that kids will like it too. Imaginative time travel mystery told in alternating voices. de los Santos and Teague do a great job weaving the time travel into their compelling narrative about a young girl reaching back into the past to fix the future. Brave characters, lyrical storytelling, and a wonderful message. This was a light read but also a deep read. How does that work, you may be wondering? I don't know, but somehow it does. Margaret can’t believe what she hears when Judge Biggs sentences Margaret’s father to death. Arson? Murder? It simply isn’t possible. Everyone with a brain had to know her father didn’t do this. But it seems very powerful people are arrayed against him. One couldn’t live in Victory, Arizona, or know the name Victory Fuel without realizing where those powerful people resided, and one of them sits before them all in his black robe with a gavel in his hand. Margaret’s best friend, Charlie, is with her every step of the way as she goes through this, but it is his grandfather Joshua who tells Charlie to bring Margaret to him. He needs to talk to her. It is Grandfather Joshua who knows the secret of Margaret, one that she doesn’t even know herself just yet. Not completely, anyway. When they meet, he tells Margaret the only way to save her father is to go back in time and change something that happened almost eighty years ago. Yes, Margaret can time travel. It is something her family can do, but the dangers are great and there are no guarantees. History resists change, strongly resists it. And Margaret has taken the vow, held her father’s warm hands in the courtroom after the sentencing and promised him. But, after talking to Joshua, after realizing there really isn’t any other hope of having hope, Margaret goes anyway, meeting Joshua in the past, when he is young and when the story of Victory Fuel was young as well. Margaret has a limited time in the past. If she doesn’t complete her task and return to the very spot she arrived in the past by a certain time, the portal will close. And, of course, there are the dangers inherent in time travel. History does indeed resist in ways they could never imagine. History seems to become almost a corporeal enemy, standing between what should be right and what is so terribly wrong. When all hope seems lost, something completely unexpected happens. 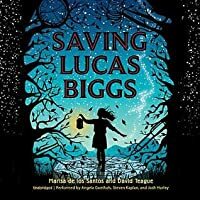 I read a book called Saving Lucas Biggs by Marisa de los Santos and David Teague. The main character’s name is Margaret. Her best friend in the book is named Charlie. Margaret’s father has just been sentenced to death by Judge Lucas Biggs for murder. Margaret does not believe her father is guilty of the crime. To be able to prove him innocent, she will have to use the family’s secret talent, one she’s been forbidden by her father to use. The book takes place in the mining town of Victory, Arizona I read a book called Saving Lucas Biggs by Marisa de los Santos and David Teague. The main character’s name is Margaret. Her best friend in the book is named Charlie. Margaret’s father has just been sentenced to death by Judge Lucas Biggs for murder. Margaret does not believe her father is guilty of the crime. To be able to prove him innocent, she will have to use the family’s secret talent, one she’s been forbidden by her father to use. The book takes place in the mining town of Victory, Arizona. The only jobs available in the town are working for the mining company. Elijah Biggs was basically the dictator of this town until he retired and then Lucas, his adopted son who later became a judge, took over. The mining company makes all of the money because they control everything in the town. They also control the unfair court system. Whenever there are problems and accidents in the mine, they manage to cover it up and blame it on other people. The main character Margaret and her best friend Charlie are both thirteen. I think Margaret is somewhat like me. She thinks things through and she will do anything to protect her family. To prove her dad’s innocence, she used her forbidden time travel ability that she promised her father she would not use at any time. Margaret thought if she went back in time, she could fix all of the mistakes that had happened to Judge Biggs and he would see that her father was innocent. There are two words that can stop her from doing that: history resists. Is it really possible to go back and change history? I think the author is saying it is possible for children to stand up for right and wrong. Children can make a difference. They don’t have to just sit around and wait for something to happen. Margaret showed this in the book by being willing to go back and try to change history to benefit her dad in the future. She was willing to sacrifice more than her time traveling ability to learn more about Lucas Biggs so that she could hopefully change his attitude in the present time. I learned a lot about mining and how it can affect the environment. Sometimes big companies overlook the safety concerns for more profit. The needs of the families and the employees were not the most important thing to them. Lucas Biggs who later became a judge was also caught up in money and that also clouded his judgment. Margaret helped him see what was right and re-connect with his own family. I did not think that the time travel ability of Margaret was believable. I did feel like the rest of the characters and the book were. They reflected the qualities of everyday people in the real world. The author is qualified to write this book because they have kids the age of these characters and know how these kids think. They are my cousins. In the time it took a man to speak a single sentence, I discovered three things: there's a reason a judge's robe looks like the Grim Reaper's; a blooming jacaranda tree can feel like a big fat slap in the face; and there is such a thing as a silent scream. That first sentence makes this book sound amazing, but it's only downhill from there. For a book about a time-traveling 13-year-old, there wasn't a lot of time travel and it wasn't very interesting. The characters weren't terribly exciting and t In the time it took a man to speak a single sentence, I discovered three things: there's a reason a judge's robe looks like the Grim Reaper's; a blooming jacaranda tree can feel like a big fat slap in the face; and there is such a thing as a silent scream. The characters weren't terribly exciting and the plot, intricate as it was at times, moved quickly through certain parts (like when (view spoiler)[Margaret first travels to 1938 and explains to Josh that she's from the future. I want to see this exchange! Not have it condensed to "Without wasting energy on further instructions, she launched into a story about traveling through time that was so strange, improbable, eerie, sad, infuriating, and confusing... that I had no choice but to believe every word." (hide spoiler)]) To me, it also seemed as if the quality of writing slowly tapered off throughout the story. This book was very cute and entertaining. I had to keep reminding myself that the teenagers involved were only 13, however. They were super brave and intelligent which made for a great story, however, they seemed much older. Another aspect of time travel that I always enjoy is when my character needs to try This book was very cute and entertaining. Another aspect of time travel that I always enjoy is when my character needs to try and assimilate. I also love when my character marvels over large or even very small differences in the way of life. This book didn't include either of these qualities. The heroine does not even appear nervous or intrigued to be in a different time. She just finds the guys she is looking for (easily) and sets off to get her business done. Turns out that the book ends with a pretty nice message message about love in the here and now and what-not, but it almost rendered the time travel portion all for not! I enjoyed this book immensely, and I'm not even a little embarrassed that the back cover says "ages 8-12." Honestly, though, that seems a little young to me. My stepson is 8, and although I think he could read all the words, he's nowhere near ready to read something as subtle and sophisticated as this book. Thinking back, I probably would have been ready at about age 9, but I was a precocious reader. That being said, readers mature enough to grasp this story will find much goodness here. It went I enjoyed this book immensely, and I'm not even a little embarrassed that the back cover says "ages 8-12." Honestly, though, that seems a little young to me. My stepson is 8, and although I think he could read all the words, he's nowhere near ready to read something as subtle and sophisticated as this book. Thinking back, I probably would have been ready at about age 9, but I was a precocious reader. That being said, readers mature enough to grasp this story will find much goodness here. It went very differently than I was expecting when I read the description, and it really made me think. An absolutely beautiful book! Luminous descriptions, memorable characters, and an active plot about Things That Matter. My favorite kind of fantasy where magic slips in to realistic settings in a way that feels like it really could happen. I also loved the emphasis on family and friendship and the unabashed affirmation of goodness in this MG book. Finally, Marisa de los Santos knows how to write about stars! It had such great possibility. Time travel, historical fiction blend, boy-girl main characters that would invite all my readers in...I'm not sure how this one was selected as a Bluebonnet title this year considering the amazing list of other titles collected. I had a hard time understanding what was going on and I am not the target audience. This one will both confuse and bore kids. I fought the urge to abandon it too many times to count. This book is so well-written. It has those sentences in it that you want to write down on index cards just so you can carry them with you everywhere. You can pull them out and reread them to prove that language can be beautiful and expressive. I am looking forward to more joint ventures from this couple. Thank you for sharing these characters with me. So good! Can’t say much because spoilers, but listening to this was like opening one great Christmas gift after another, it was so rife with stuff up my alley. I love great YA lit. BOOK REVIEW: 'Saving Lucas Biggs': Can Time Traveling Change the Outcome for a Doomed Man? Margaret O'Malley, the feisty protagonist in "Saving Lucas Biggs" (HarperCollins Children's Books, 288 pages, $16.99, suitable for ages 8-12 -- and adults) will do anything to save her father from a death sentence….even if it means breaking a family taboo and traveling back 76 years to change history. Authors Marisa de los Santos and David Teague, a married couple, are outstanding BOOK REVIEW: 'Saving Lucas Biggs': Can Time Traveling Change the Outcome for a Doomed Man? Authors Marisa de los Santos and David Teague, a married couple, are outstanding in their portrayal of 13-year-old Margaret and her pal Charlie and everybody else in a book aimed at young readers that teens and adults will enjoy, too. Margaret knows her father, whistleblower John Thomas O'Malley, is innocent, but that doesn't stop the cruel Judge Lucas Biggs from sentencing him to death. John O'Malley, a geologist for Victory Fuels Corp., in the company town of Victory, Ariz., has been convicted of arson and the murder of a man inside the lab he's accused of torching. Margaret is determined to save her dad, even if it means using her family's secret—and forbidden—ability to time travel. With the help of her best friend, Charlie, and his grandpa Josh, Margaret goes back to a time when Judge Biggs was a young boy and tries to prevent the chain of events that transformed him into a corrupt, jaded man. But with the forces of history working against her, will Margaret be able to change the past? Or will she be pushed back to a present in which her father is still doomed? Back in 1938, the town is in the midst of a bitter strike by coal miners. It's reminiscent of the mine wars of West Virginia and also an event that resonates in the history of Colorado and American labor relations: the Ludlow Massacre of April 20, 1914. Told in alternating voices between Margaret and Josh, "Saving Lucas Biggs" shows that sometimes the forces of good need a little extra help to triumph over the forces of evil. This is a good lesson for young readers -- and older ones and adult alike. Marisa de los Santos: "I became a writer because I love the sound and texture of words (current favorite consonant sounds: Ls and hard Cs) and love to hear what happens when they bump up against each other. I was a poet for a long time (my first book is a collection of poetry called FROM THE BONES OUT), and then, one day, unexpectedly, I found that I had a voice inside my head. As you might imagine, this was a bit alarming. However, in time, I discovered that the voice belonged to a character named Cornelia Brown, so I wrote a novel called LOVE WALKED IN about her and an eleven-year old girl named Clare. After that, I became addicted to writing novels. I wrote a second one called BELONG TO ME, and my third, FALLING TOGETHER, came out on October 4th, 2011. I'm now working on a fourth, tentatively titled THE PRECIOUS ONE. I live with my husband, children's book author David Teague, and our two kids, Charles and Annabel, in lovely Wilmington, Delaware." This is their first collaborative book. Confession: I don’t read much middle grade. OK, any. Including Harry Potter. (I know, I KNOW.) But I’m a sucker for a good time travel story, and I loved the synopsis of Saving Lucas Biggs, a book that proved to be both moving and thought-provoking. Margaret comes from a long line of time travelers. When the story begins, her father has been sentenced to a death by the crooked judge, Lucas Biggs, for a murder he didn’t commit. Margaret liv This review and others are posted at Inspiring Insomnia. Margaret comes from a long line of time travelers. When the story begins, her father has been sentenced to a death by the crooked judge, Lucas Biggs, for a murder he didn’t commit. Margaret lives in Victory, Arizona, a mining town that is virtually run by the Victory Corporation. Her father is a geologist, and when he exposed the deadly pollution and environmental damage that was occurring as a result of Victory Corporation’s reckless mining practices, they retaliated by framing him for murder. We have to overlook a few little things, like the fact that there is apparently no appeals process in this Arizona, and apparently death sentences are carried out very quickly. Once we accept this, we can understand Margaret’s desperation and sense of urgency. She has been taught by her father that her ability to time travel must be kept secret and must never be used to alter the past. In Saving Lucas Biggs, time travel is not simple. As Margaret has been taught, the universe strongly resists any attempts to alter history. The time traveler can die or get stuck in the past if he or she stays too long. And of course, the most inconsequential actions can have a profound affect on the future. Knowing the risks, Margaret still feels she must do whatever she can to prevent her father’s execution. Grandpa Joshua is Margaret’s best friend, Charlie’s grandfather. He senses Margaret’s ability, and he encourages her to use it to save her father’s life. They plan to have Margaret travel back to 1938, when Josh was a teenager and the future Judge Lucas Biggs was his best friend. By doing so, she may be able to alter the past, despite the dangers, and set Lucas off the path that leads him to become the evil man that he is today, thereby saving Lucas Biggs. The chapters alternate between Margaret’s 2014 world and Josh’s world in 1938, which Margaret soon visits. I loved the 1938 world, and these parts felt like a very thoughtful work of historical fiction. The miners are terribly exploited by Victory Corporation, until one heartless action causes them to revolt. Margaret and the teenaged Josh and Lucas become swept up in the action, and Victory Corporation in 1938 proves to be every bit as dangerous as Judge Biggs in the present time. So, can a man like Lucas Biggs really be saved? You probably already know the answer to that. But what may surprise you is how he’s saved and by whom. What could have been a simple time travel story becomes a sweet lesson in redemption, the power of second chances, and the love of family. This story explores the self-delusion of a man, Lucas Biggs, and how it leads to his unhappy life. Bigg's self-justification and a series of bad decisions result in him leading a life as a corrupt judge and hateful person. Once, he was a nice boy. Once, he tried to do the right thing. But the desire for physical revenge, versus nonviolent civil disobedience, and his youthful ignorance led him down the slippery slope of wrong-doing. While the story is somewhat slow at the start and appears realis This story explores the self-delusion of a man, Lucas Biggs, and how it leads to his unhappy life. Bigg's self-justification and a series of bad decisions result in him leading a life as a corrupt judge and hateful person. Once, he was a nice boy. Once, he tried to do the right thing. But the desire for physical revenge, versus nonviolent civil disobedience, and his youthful ignorance led him down the slippery slope of wrong-doing. While the story is somewhat slow at the start and appears realistic before changing into a time travel story, I liked the author's turn of phrases and character development of the protagonist, thirteen-year-old Margaret. The point of view alternates between her and Josh as they try to make sense of and right past wrongs. Most of the time they fail, but they never give up or give into despair. Margaret's father has been convicted of a crime he didn't commit and sentenced to death. The mining town of Victory, Arizona is owned by the Victory Company along with corrupt town leaders in powerful positions. Margaret learns that this corruption has deep roots in the past and that in order to change it, she must use her family's unique ability to travel into the past and change history. When her mission fails, she learns to pursue other means of reaching Lucas Biggs, the man that lost so much and chose to be unethical. She shows great courage in her choices and with the help of her friend, Charlie, and Josh, they make a difference. I found that it took me a while to get into the story. I preferred when Josh's flashbacks put the reader directly into the action versus when he was explaining it to Margaret and Charlie in the present tense. If you are a cartwheeling-type person like myself you might find the pace or passive voice too slow in those moments. I also wished the letter that Margaret wrote to the newspaper was revealed to the reader. I did find the information on hydrofracking interesting, I've been hearing that word quite a bit lately as we have friends in North Dakota and never took the time to learn what it meant. The emotional descriptions of Magaret's inner turmoil are rich and wonderful to read. "What I wanted more than anything was to be alone, to sit in my own pocket of space and just breathe and feel, feel whatever there was to feel without worrying about anyone seeing me." Margaret learns to have courage and be brave rather than hide. She reflects that her motivation to be brave is out of her love for her dad, just like Bigg's love for his dad motivated him to change. The theme of love and family is an undercurrent throughout the plot. A good book for messages on redemption, friends, loyalty, courage, and civic responsibility. 4.5 stars. I really really really love how this was written. Plus, the theme of this story is pretty great too! Before I begin telling you about Saving Lucas Biggs, can we take a minute to marvel at how gorgeous this cover is? I'm really obsessed with the colors, and the whimsical look to it. Saving Lucas Biggs was definitely a good read. The novel combined whimsical elements (the time travel) with more realistic ones (Margaret's father's current circumstances) in a really appealing way. Honestly, I expected this story to be pretty straightforward and predictable, but the way things were resolved still managed to surprise me - and I like it! For such a young set of main characters (yes, thirteen feels young to me! ), they are facing such serious issues. I won't go into detail here, but it has a lot to do with unfair pay, unjust decisions and unnecessary deaths, both in the present and past. These issues, however, lead our main characters on a journey that teaches readers an important lesson: how actions affect the course of a person's life, their choices and how they choose to be. That, really, is the heart behind this novel. Margaret goes into the past, visiting her best friend Charlie's grandfather Josh at her age. Together, they attempt to change the future by altering the past to change the circumstances that turned Judge (Lucas) Biggs into the cold, hard man he is. The adventure is fraught with risk, tension and danger - and yet, I couldn't stop reading until I found out if they were going to succeed or not. Apart from the moral lesson readers will take away, the characters were really great. Margaret and Josh were excellent main characters, and I could root for them immediately. Charlie, Margaret's best friend, is definitely a prime example of support and encouragement, and Josh, Charlie's grandfather and formerly Lucas' childhood friend, was wonderful as well. The writing too, is a testament to the authors' skills, as it flows well, easing from one perspective to the next smoothly. The only complaint I have is the slightly abrupt ending, but it wasn't too off-putting overall. I did like Saving Lucas Biggs. The concept is simple enough, but the authors really brought it to life with great characters, and excellent plotting. If you're intrigued by the sound of time travel and changing the future through altering the past, well then, Saving Lucas Biggs is probably right up your alley! When Margaret’s father is sentenced to death, she can’t believe it since she is certain he is innocent. But this is what happens when someone tries to stand up to the company that owns the entire town. It’s also the company that owns Judge Biggs. The only way that Margaret can see to save her father is to change Judge Biggs’ mind. According to Grandpa Josh, her best friend’s grandfather, Judge Biggs used to be a good person until his father was accused of murder and hung himself. The only person When Margaret’s father is sentenced to death, she can’t believe it since she is certain he is innocent. But this is what happens when someone tries to stand up to the company that owns the entire town. It’s also the company that owns Judge Biggs. The only way that Margaret can see to save her father is to change Judge Biggs’ mind. According to Grandpa Josh, her best friend’s grandfather, Judge Biggs used to be a good person until his father was accused of murder and hung himself. The only person who can change the course of time is Margaret who has to use her family’s forbidden power of time travel. But history resists change and Margaret only has a few days before history rejects her to make the necessary changes to save her father. De los Santos and Teague have written a book that takes on time travel in a very refreshing way. The idea that history actively resists change and that there is a physical toll on the time travelers makes for frustrating time travel. Yet it feels right and also creates tension in the story at just the right moment. The authors also explore company towns and how workers tried to stand up to unfair business practices. Here there is plenty of action in that fight, including murder and gunfire as well as quiet desperation. Margaret is a winning character, one who travels in time very reluctantly but is given little choice when she is the sole person who has a chance of saving her father. The story dives into complexity, never making things easy or simple. One aspect of this is the way that redemption is viewed. Characters are seen as changeable, able to be rescued from what happened to them even in their elder years. This book is about getting chances to make the right choice in the end, forgiveness for poor choices earlier, and friendships that stand through time and betrayal. I liked this book enough to finish it, but I had a lot of problems with it. It might have partly been the narration, since I listened to the audiobook, but the main character thought in very flowery and melodramatic prose that seemed a little unrealistic for anyone, let alone a 13 year old. I get that she's depressed, but the language used in expressing it wasn't very believable to me. I also had a hard time with various aspects of the premise. While the evil mining corporation abuses rights of I liked this book enough to finish it, but I had a lot of problems with it. It might have partly been the narration, since I listened to the audiobook, but the main character thought in very flowery and melodramatic prose that seemed a little unrealistic for anyone, let alone a 13 year old. I get that she's depressed, but the language used in expressing it wasn't very believable to me. Recommended for kids and adults alike! These are the books that reaffirm my love of children's literature <3 Time travel, hope, plans that didn't work, research at the library, friendship, nonviolent protest, and more - this novel has it all. "...a place isn't just a snapshot of itself in the present; a place is everything that ever happened in it." "It was a cinnamon-scented day, the kind you slip into your pocket, carry with you when you leave, and never lose." "I t Recommended for kids and adults alike! These are the books that reaffirm my love of children's literature <3 Time travel, hope, plans that didn't work, research at the library, friendship, nonviolent protest, and more - this novel has it all. "I thought about what my dad had said about all the small goodnesses adding up to amazing. I thought about Grandpa Joshua's voice shaking, even after all these years, at the part in the letter where Aristotle talked about Luke. Goodness. Yes, that was right. The kind that connects one person to another person and never goes away. 'Love', I blurted out." "Charlie and I flat-out loved the library. It was the first place we'd ever walked to alone together, without any adults, so maybe we got used to it feeling like an adventure. What I think we loved best about it was the sense of possibility: the sight of all those books just lined up, one after the other after the other, with whole worlds clapped between their covers." If I wasn't responsible for reviewing as many books per year as I need to for my committee work, I'd start this one over again right now. This husband and wife author team come from backgrounds of writing for adults and young children, and magic happened when they met in the middle. A gorgeous story about a young girl willing to do whatever it takes to save her father's life after he is found guilty of arson and murder. The opening of this book is so intriguing-it would be impossible for anyone to read to page four and not want to forge onward. Love, loyalty, bravery and time-travel merge into a tightly woven story that is full of danger, suspense and the reminder of the strength of friendship. One thing that this book really impressed upon me is all the little goodness that people do: the wonderful math equation of all the little good things that add up to more than the bad things done. It is a book of hope and never giving up on someone you love. It does describe murders that happened in the book, but in emotional detail, not gore. Half way through reading the book, I knew I wanted it in my personal library, because I knew I would want to revisit it. When I hear about bad things happe One thing that this book really impressed upon me is all the little goodness that people do: the wonderful math equation of all the little good things that add up to more than the bad things done. It is a book of hope and never giving up on someone you love. It does describe murders that happened in the book, but in emotional detail, not gore. Was overall pretty disappointed with this book. Being a big fan of Marisa de los Santos' adult fiction, of YA fiction generally, and of stories concerned with time travel, I expected big things from this. The characters were flat and underdeveloped, it was all resolved too quickly, I had felt as a reader that I had little investment in the characters and the lyrical almost poetic writing of de los Santos was entirely absent. This is an amazing book about history time travel, and the way we think about the past and the present. I listened to this as an audio book which I think enhanced it even more. As the different narrators changed, so did the reader's voice. This book had so many layers to it. Historical fiction was fantastically weaved with the fantasy of time travel and the mystery of solving the crime of Victory. Great storytelling. Great word choice. Great theme. It was a fantastic read. And the cover is pretty amazing, too. That took me a while to really see. So the story itself was pretty good, but I would not recommend listening to it on audio book. The woman who read Margaret was terrible. Her tone as she read had a constant sense of misery and foreboding, even when something was supposed to be funny. It took away from the story and was overall quite disappointing. I was looking for a simple to follow soft fantasy that started with a bang and would engage impatient seventh graders (something like THE CITY OF EMBER) and instead I came away with a slower paced and somewhat difficult to track story. I am not saying the book doesn't have its merits -- it's just not a book I am in need of. Marisa de los Santos is the New York Times bestselling author of LOVE WALKED IN, BELONG TO ME, FALLING TOGETHER, THE PRECIOUS ONE, and her newest novel, which continues with characters from the first two, I'LL BE YOUR BLUE SKY. 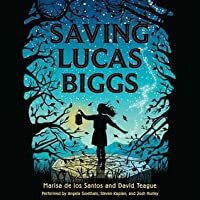 Marisa has also co-authored, with her husband David Teague, two novels for middle grade readers: SAVING LUCAS BIGGS and CONNECT THE STARS. Marisa and David live in Wilmingto Marisa de los Santos is the New York Times bestselling author of LOVE WALKED IN, BELONG TO ME, FALLING TOGETHER, THE PRECIOUS ONE, and her newest novel, which continues with characters from the first two, I'LL BE YOUR BLUE SKY.